A 19th century, French copper, turbotiere. This unusual shape of pan was used for cooking turbot. This one is no longer fit for cooking, as the tinning is worn, but it would be an interesting piece to use for a plant display in the middle of a large table. 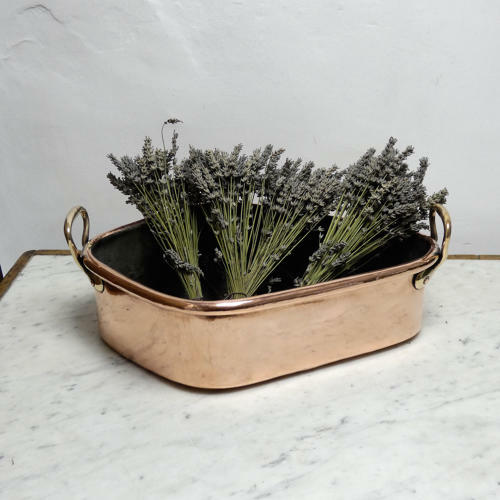 It is made from a very heavy gauge of copper, has brass handles to either side and it has castellated seams around the base and up the side. It dates from c.1860 and it is in excellent condition. The pan is 48.5cm. long by 39.5cm. wide by 10cm. deep. The overall size, including the handles, is 52cm. long by 16cm. high. Price includes postage with in the U.K. Shipping to the U.S.A. add £40. Western Europe add £15.